So you have your nice shiny new Ubuntu OS set up and you want to browse the latest Simon’s Cat or Zero Punctuation videos on YouTube. And it doesn’t work. Because Ubuntu only includes open source software by default, and the plug-in needed is not open source (yet). The main thing you need to play online videos is an Adobe Flash Plug-in. You can install Flash straight from their website or you can get it via your Ubuntu Software Centre, Synaptic Package Manager or even just through your Terminal. I’ll explain each of these methods so you can choose the one that suits you. NOTE: If you have already installed the Ubuntu Restricted Extras package from the previous post you may find Flash Player is already installed. Either way it is best to make sure it is there and installed correctly. To install the Adobe Flash Plug-in, open the Terminal (Applications > Accessories > Terminal), copy and paste the following command, and hit enter. They are different ways of doing the same thing. It will probably ask you to type your Administrator password to execute the command, which is one of the best ways Ubuntu keeps your system secure. Nothing runs without your permission. Anyway, that’s all you need to do. To install the Adobe Flash Plug-in using this method, open the Ubuntu Software Centre from the Applications menu (if you haven’t got this by default please see my previous post). 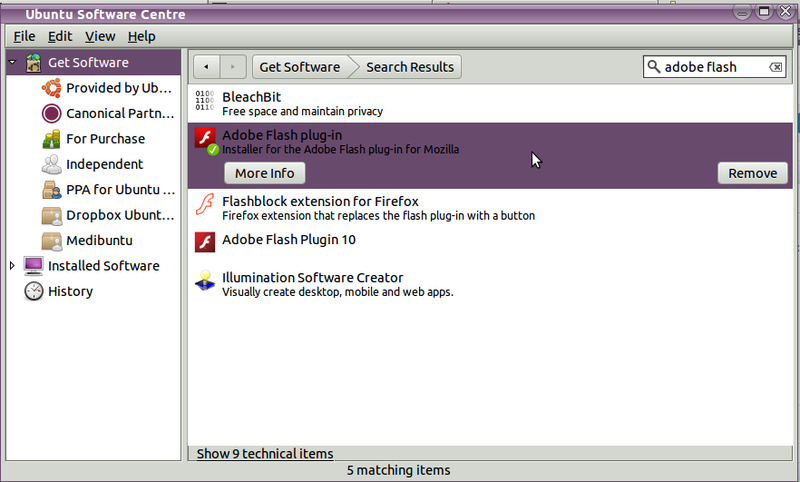 Then in the search box type Adobe Flash. As I already have it installed I have a Remove option where the Install option would usually be. NOTE: if you have not allowed your mutiverse repository Adobe Flash may not show up. My previous post will show you how to include the multiverse repository in the Ubuntu Software Centre. To install simply click the Install button, enter your Administrator password when asked, and it’s done. If you prefer using Synaptic Package Manager, open Synaptic Package Manager, type your Administrator password, and ensure you have access to the multiverse repository (see previous post on how to do this). 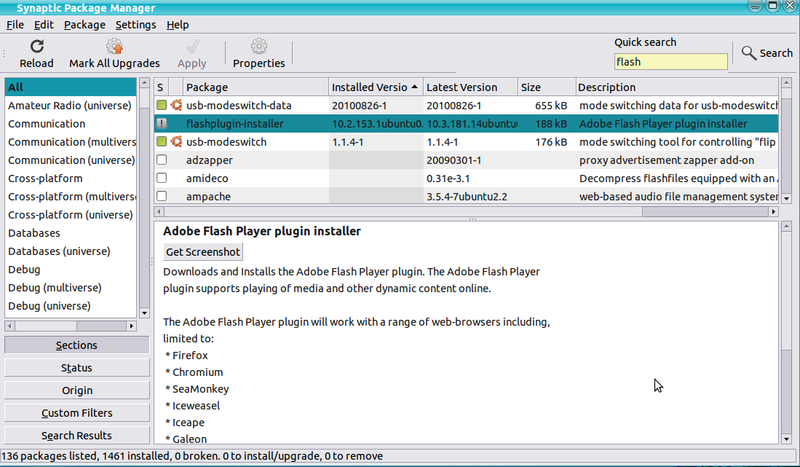 Type ‘flashplugin-installer’ in the Quick Search and it should be the one at the top of the list. Right click and choose Mark for Installation. When you do this it may ask whether you want to install recommended packages for it as well. Choose yes. Then click Apply and everything should be up and running.